15 tins contain all the seasonings you need, plus recipes, for five knockout tacos from around the world. Sure, tacos are spicy, but do they spice up your life? If not, it's time to rev up your tastebuds and and take a whirlwind trip around the world with Julie Pedersen's globally inspired seasoning kit. The 15 tins contain all the spices, herbs, and blends you need to make five knockout variations on the theme of tacos, including slammin' Austin jackfruit tacos, Spanish smoked paprika cauliflower tacos, or Indian eggplant tacos with fennel slaw (recipes included). An inspired gift for taco lovers, foodies, and entertainers who like experimenting in the kitchen. Assembled in Canada. Looking for more globally-inspired dinners? Try our Global Chili & Stew and Global Pizza seasoning kits! I smelled my son's and now I want one for me! Use for fun, flavorful tacos! The recipes contained inside are vegitarian. That said, the spices made a cool gift, and with some ingenuity I was off to delicious MEAT tacos! I was very excited for this gift. And although I knew I could purchase similar spices for less I thought the kit would be neat, and the recipes would be a fun way to actually use the spices. When my son opened the gift I was surprised to see that it was a vegetarian recipe kit. I checked the listing again, thinking I had received the wrong product. But after rereading the description I see that the selection of recipes that were listed were non meat, so I am assuming this actually is a vegetarian kit, which is not what I intended to purchase. The recipe booklet was printed on standard paper and the heading were cut off, unprofessional presentation. I was expected this to be pre-mixed seasonings in tins, but in fact it was just spices, and recipes for you to make yourself. Kinda defeats the purpose of my purchase, I can find recipes and use spices I have at home..
Bought a taco seasoning kit for my sister for Christmas since she likes to cook. I thought this would be a neat, artisan gift that would expand her range in the kitchen. When it came in, I was a little disappointed with the quality of the packaging. The spice labels are printed on a thin piece of printer paper and the individual containers seemed a little cheap to me. I know that does not necessarily mean the spices are bad quality, but it does not make me feel super confident that they worth the money. We'll have to see when my sister actually cooks with then what she thinks. Anyone who loves to cook will love to experiment with these spices. Lots of classics and even more unique blends to choose and experiment with! Unique gift for the cooking enthusiast. Will be a great kit to create a fun cooking experience for my sister in law & her boyfriend. They can experience the world of cooking right in their own kitchen. Although I have to say it was quite pricy. If you like to cook, I would recommend this product. 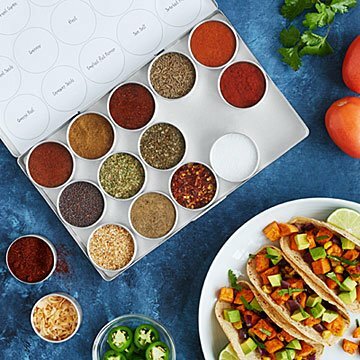 You can use the seasonings for a variety of cooking styles - it doesn't have to be used just for tacos.